The sprig of thyme is a choral arrangement by the American composer and Grainger scholar, Dana Paul Perna. 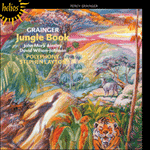 Grainger’s original setting of the folk-song collected from Joseph Taylor of Saxby-All-Saints, Lincolnshire, was made for his mother’s birthday in 1920. The arranger comments: ‘While listening to a recording of this Lincolnshire folk-song in Grainger’s voice and piano version, I began to imagine how it would sound cast for mixed voices. The use of the male voice four-some corresponds to Grainger’s own use of the same forces in his settings of Dollar and a half a day, Shenandoah and Stormy …’. And he stole all this thyme away. But I really did refuse them all three. Addend so doz my time grow on.